Intravenous immune globulin (IVIG), pooled from human blood, is a polyspecific antibody preparation that inhibits the super-antigenic proteins associated with streptococcal and staphylococcal toxic shock, and the Shiga toxin. In addition to this toxin-neutralising activity, IVIG contains other pathogen-reactive antibodies that may confer additional therapeutic benefits. We sought to determine if pathogen-reactive antibodies that promote opsonophagocytosis of different organisms can be sequentially affinity-purified from one IVIG preparation. Antibodies that recognise cell wall antigens of Streptococcus pyogenes, Staphylococcus aureus, and vancomycin-resistant enterococcus (VRE) were sequentially affinity-purified from a single preparation of commercial IVIG and opsonophagocytic activity was assessed using a flow cytometry assay of neutrophil uptake. Non-specific IgG-binding proteins were removed from the S. aureus preparations using an immobilised Fc fragment column, produced using IVIG cleaved with the Immunoglobulin G-degrading enzyme of S. pyogenes (IdeS). Affinity-purified anti-S. aureus and anti-VRE immunoglobulin promoted significantly higher levels of opsonophagocytic uptake by human neutrophils than IVIG when identical total antibody concentrations were compared, confirming activity previously shown for affinity-purified anti-S. pyogenes immunoglobulin. The opsonophagocytic activities of anti-S. pyogenes, anti-S. aureus, and anti-VRE antibodies that were sequentially purified from a single IVIG preparation were undiminished compared to antibodies purified from previously unused IVIG. The online version of this article ( https://doi.org/10.1186/s13104-019-4262-8) contains supplementary material, which is available to authorized users. Intravenous immune globulin (IVIG) is a clinical antibody preparation purified from pooled human plasma obtained from at least 1000 donors . Previously we demonstrated that immunoglobulins reactive against cell wall components of the human pathogen Streptococcus pyogenes can be purified from IVIG. In a murine model we used these immunoglobulins to reduce the severity and microbial burden of invasive S. pyogenes infection . A small number of pre-clinical and in vitro studies have shown that IVIG has activity against other bacterial pathogens [3, 4, 5], including Staphylococcus aureus and Enterococcus spp., which have emerged as important agents of antimicrobial-resistant infections. The reported activity of polyspecific IVIG against S. aureus in vitro and in a rabbit pneumonia model [6, 7] and against Enterococcus spp. in an in vitro model of opsonic killing [4, 8] coupled with the antimicrobial efficacy of S. pyogenes-reactive “enhanced” (E)-IVIG in vivo  led us to investigate if antibody pools with enhanced opsonic activity against S. aureus and Enterococcus could be recovered from a commercial IVIG preparation. As the preparation of IVIG requires many blood donations and is costly, limiting its supply in some parts of the world, we also determined whether different pathogen-reactive antibody pools could be sequentially purified from a single vial of IVIG, maximising the potential yield of this approach. Five vancomycin-resistant enterococcal isolates (H1544-H1548) from routine rectal screening were cultured overnight in Todd-Hewitt broth at 37 °C + 5% CO2. S. aureus isolates were cultured overnight in brain–heart infusion at 37 °C with agitation at 225 rpm. For immunoglobulin-binding protein removal from S. aureus, pilot studies were conducted using clinical isolates HSS354-356. For E-IVIG preparation, five S. aureus CC8 lineage isolates were used: USA300, Newman, NCTC8325 , HHS-4 and HHS-5 . Opsonophagocytosis assays were performed using Oregon-green 488 labelled methicillin-resistant S. aureus isolate USA300, S. pyogenes emm1 bacteraemia isolate H364 , and VRE isolate H1548. To generate separate Fc and F(ab) fragments, IVIG consisting of ≥ 98% IgG (Privigen, CSL Behring)  was digested with recombinant Immunoglobulin G-degrading enzyme of S. pyogenes (IdeS) as previously described  and purified as outlined in Additional file 1: Methods. For resin immobilization, purified Fc fragments were dialysed into coupling buffer (0.1 M sodium bicarbonate, 0.5 M sodium chloride; pH 8.3) overnight at 4 °C. Coupling to cyanogen bromide activated agarose resin (CNBr) (Sigma Aldrich) was performed at a protein concentration of 1 mg/ml according to the manufacturer’s instructions. Staphylococcal and enterococcal cell wall extracts (CWE) were prepared from five individual isolates, as previously described  using 1 mg/ml lysostaphin in place of lysozyme for S. aureus. To remove the IgG-binding proteins Sbi and protein A , staphylococcal CWEs were passed over the prepared Fc fragment column twice. The Fc column was stripped with 0.5 M NaOH and washed extensively with PBS between samples. To demonstrate adequate removal of IgG-binding proteins, 5 µl aliquots of S. aureus CWE from three clinical isolates were spotted onto a Hybond-LFP membrane (GE Healthcare) before and after IgG binding protein removal. Membranes were blocked with 5% (w/v) skim milk powered (Sigma Aldrich) in PBST and probed with 5 µg/ml of SEC purified Fc fragments (diluted in blocking buffer). Following three washes in PBST, membranes were incubated in a 1: 80,000 dilution of HRP-conjugated goat anti human IgG (Fc specific, Abcam). Bound antibodies were detected using ECL prime western blotting detection reagent (GE Healthcare) and exposure to chemiluminescent film (Amersham Hyperfilm ECL, GE Healthcare). In later experiments, IgG binding protein-depleted staphylococcal CWEs were separated by SDS-PAGE and transferred onto Hybond-LFP in duplicate. The resulting membrane was split, and probed with 5 µg/ml of IVIG, or 5 µg/ml of IdeS-cleaved IVIG (used in place of purified Fc fragments) as described above. Following secondary antibody incubation, the membrane was reassembled and developed as described above. For resin immobilisation, equal quantities of CWE from the five CC8 S. aureus or enterococcal strains selected for study was pooled and coupled to CNBr as outlined above. Streptococcal, Staphylococcal and Enterococcal-reactive Enhanced (E)-IVIG was affinity-purified from previously unused IVIG using immobilised CWEs as described previously and in Additional file 1: Methods . For sequential purification of pathogen-reactive E-IVIG preparations, IVIG was passed over an S. pyogenes CWE column prepared previously , followed by the S. aureus CWE column or vice versa. Twice depleted IVIG was subsequently passed over the Enterococcal CWE column to produce the third, pathogen-reactive antibody pool. Neutrophil opsonophagocytosis assays were performed as previously described  using freshly isolated human neutrophils to demonstrate uptake of opsonised, Oregon green 488-labelled S. aureus USA300, S. pyogenes isolate H364, or VRE isolate H1548. We hypothesised that opsonic antibodies could be purified from IVIG by affinity chromatography using cell wall antigens from different bacterial pathogens. To prevent non-specific antibody purification, the IgG binding proteins Sbi and protein A were removed from the S. aureus CWEs prior to affinity resin preparation using an immobilised Fc column produced from IdeS-cleaved IVIG (Fig. 1a). Passing CWE from three clinical S. aureus isolates over the Fc column reduced levels of non-specific IgG binding (visualised using purified Fc fragments) below the limit of detection of the ECL prime reagent, indicating that the majority of non-specific immunoglobulin-binding proteins had been removed from the samples (Fig. 1b). To confirm the presence of conserved, IVIG-reactive antigens across the clinically important CC8 S. aureus linage, CWEs were prepared from five CC8 isolates, and IgG-binding proteins were depleted as outlined above. IVIG-reactive proteins were visualised by immunoblotting in duplicate, using either intact IVIG or IdeS-cleaved IVIG as primary antibodies, and Fc-specific secondary antibody. Immunoblot analysis using intact IVIG revealed a common banding pattern, suggesting that many recognised antigens may be conserved among CC8 isolates (Fig. 1c). 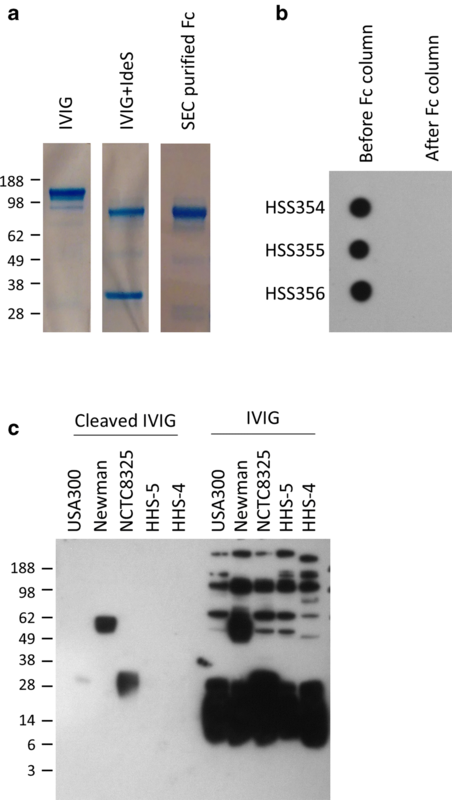 IdeS-cleaved IVIG was used to reveal any residual proteins that bound non-specifically via the Fc domain, and confirmed that IgG binding protein removal had largely been successful in these samples. Carryover of IgG-binding proteins in the Newman and S. aureus 8325 samples was apparent, consistent with reported high levels of Sbi production by S. aureus Newman . Accordingly, these samples were re-applied to the Fc column prior to affinity resin preparation. To determine if functional anti-staphylococcal immunoglobulin could be purified from commercially available IVIG using immobilised S. aureus CWE, an affinity purification column was prepared using the IgG binding protein-depleted CC8 CWEs. S. aureus-reactive E-IVIG was affinity-purified as outlined in “Materials and methods” section and the ability of the resulting eluted preparation to promote human neutrophil uptake of USA300 was compared to commercial IVIG. Following a 30 min co-incubation, the percentage of neutrophils containing labelled S. aureus USA300 was significantly higher in the presence of affinity-purified S. aureus E-IVIG compared to commercial IVIG at all concentrations examined (Fig. 2a). Application of IVIG to an affinity-purification column prepared using CWE from five isolates of vancomycin-resistant enterococcus resulted in the generation of an E-IVIG preparation with enhanced anti-enterococcal activity in the same neutrophil assay, using one of the VRE clinical isolates as the target organism (Fig. 2b). Neutrophil uptake of VRE was however lower than observed for USA300, possibly reflecting the presence of fewer antigenic epitopes on the enterococcal cell surface. Together with previous data showing enhanced uptake of S. pyogenes with E-IVIG and other reports [2, 4], these data confirm that commercial IVIG contains opsonic antibodies that recognise S. pyogenes, S. aureus and Enterococcus spp., and that such antibodies can be purified and concentrated from commercial IVIG. To determine if pathogen-reactive antibodies can be consecutively purified from a single vial of IVIG, sequentially purified E-IVIG reactive against S. pyogenes, S. aureus and VRE was prepared as outlined in “Materials and methods” section using the flow through from a previous E-IVIG purification. These preparations were then assessed for opsonic activity. The level of neutrophil uptake promoted by the sequentially purified E-IVIG pools did not differ appreciably from the levels promoted by cognate E-IVIG preparations from previously unused IVIG at a fixed concentration of 25 µg/ml (Fig. 3). These data indicate that it is possible to sequentially purify at least three pools of pathogen-reactive antibodies from the same preparation of IVIG without a detectable reduction in opsonophagocytic activity, and without waste. Intravenous immune globulin (IVIG) is a clinical blood product that is predicted to have activity against a variety of different bacterial and viral pathogens based on existing experimental, but not clinical, data. However, IVIG has not shown clear success in clinical sepsis trials ; perhaps in part because the concentration of pathogen-reactive antibody in IVIG is not sufficient to provide passive protection. Previously , and in this report, we have demonstrated that pools of S. pyogenes, S. aureus and Enterococcal-reactive antibodies with enhanced opsonic activity can be purified from commercial IVIG. In addition, our data indicate that such pools can be purified sequentially without an appreciable loss in opsonophagocytic activity; suggesting that further studies into the sequential purification of multiple, pathogen-reactive E-IVIG preparations from commercial IVIG are warranted. In this report we did not investigate whether the order in which the immunoglobulin pools were purified impacted upon the functionality of the resulting E-IVIG preparations. It is conceivable that cross-reactive antibodies that recognise all three pathogens are present within the starting IVIG preparation. In our study, no difference in opsonic activity was detected between sequentially purified E-IVIG and E-IVIG prepared from previously unused IVIG against the three pathogens studied however, reductions in potency may become apparent if additional pathogens are included, and the number of sequential purifications undertaken is further increased. Passive immunisation has previously been investigated as a treatment for invasive S. aureus infection, with the most promising antibody preparation (Altastaph) reaching phase two clinical trials prior to cessation of development [15, 16]. Altastaph is a polyspecific IgG preparation purified from patients vaccinated with recombinant conjugated preparations of S. aureus type 5 and type 8 capsular polysaccharide [15, 17]. Protection is therefore based on the presence anti-CPS antibodies; however, anti-type 5 CPS concentrations were estimated at 4% of the total administered IgG  indicating that the majority of immunoglobulin was not specific for S. aureus. In contrast, the affinity purification process applied herein dramatically increases the concentration of S. aureus or VRE-reactive immunoglobulins present within the reagent, which may improve the efficacy of passive immunisations markedly. Demonstration that such reagents could be useful in human disease will require additional experimental work. For example, it is widely recognised that neutrophil uptake assays and murine studies alone are not necessarily predictive of S. aureus clearance in human disease . Nonetheless, as the pipeline of antimicrobial reagents slows down, the use of adjunctive immunological reagents that collaborate with the immune system represents a potentially useful approach to treatment of multidrug-resistant pathogens. As such, the use of affinity-purified E-IVIG is an approach that should be explored further. Neutrophil uptake was assessed using a flow cytometry-based assay which does not allow the viability of the associated bacteria to be assessed. The bactericidal activity of the E-IVIG preparations, either in vivo or in an opsonophagocytic killing assay, remains to be determined. Bacterial uptake has only been shown for a single isolate of S. aureus and VRE, although the ability of E-IVIG to promote uptake of multiple S. pyogenes isolates has previously been described . A single brand of IVIG was used, and we cannot extrapolate our findings to other commercial preparations without testing, noting that population exposure to certain pathogens may differ. S. pyogenes E-IVIG can however be purified from three different commercial IVIG preparations, suggesting that, for common pathogens, the ability to purify pathogen-reactive antibody pools is unlikely to be limited to specific IVIG preparations . MR and SS devised the study, MR performed the experiments and analysed the data, MR and SS prepared the manuscript. Both authors read and approved the final manuscript. 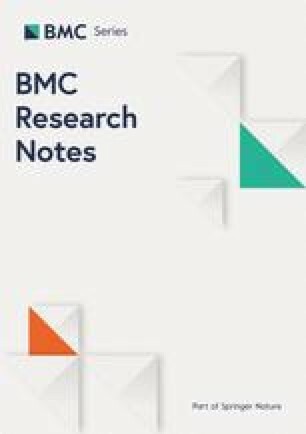 The authors acknowledge the NIHR Biomedical Research Centre (BRC) awarded to Imperial College Healthcare Trust, and in particular BRC support for the Infection Biobank and Imperial College Healthcare Trust Tissue Bank. Human neutrophils from normal donors were obtained following informed consent from a sub-collection of the Imperial College Healthcare NHS Trust Tissue Bank. Use of the sub-collection was approved by the Tissue Bank Ethics Committee (Approval R12023). This work was supported by the UK Clinical Research Collaboration (Centre for Infection Prevention & Management, Grant G0800777) and by the Medical Research Council (UK) through a Confidence in Concept Award. The research was also supported by the National Institute for Health Research (NIHR) Health Protection Research Unit (HPRU) in Healthcare-associated Infections and Antimicrobial Resistance at Imperial College London in partnership with Public Health England (PHE) (Grant No. HPRU-2012-10047). The views expressed are those of the author(s) and not necessarily those of the NHS, the NIHR, the Department of Health or Public Health England. The funding bodies had no role in the design of the study; the collection, analysis, or interpretation of data or the writing of the manuscript. Additional file 1. Contains details of Fc fragment and E-IVIG purification protocols. Privigen Prescribing Information. https://www.privigen.com/prescribing-information. Accessed 23 Mar 2019.